His plan was elegant and simple. Yesterday morning (Feb 1, 2009), a 21-year-old man from Belgium broke into a building that adjoins a branch of Banque Populare in Marseilles, France. 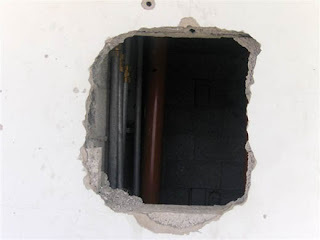 His plan was to drill through the adjoining wall and rob the safe-deposit boxes that were located on the other side. The drilling went very well. Unfortunately, he didn't measure things quite right. Instead of breaking into a room with safe-deposit boxes, he broke into the restroom-- the bathroom, the toilet, the lavatory, the used-coffee lounge. The disturbance in the restroom set off the bank alarms. When the police arrived, they caught the man at the scene. The good news is that he has a ready-made mentally incompetent defense. pandas are so cute. look, she wants my jacket. got a tooth? marry a dog. think you are tired of the crowds?